Welcome to a dreamy waterfront townhouse in one of Nantucket's best locations—on Nantucket Sound and 1/4 mile from Main Street. If summer in Nantucket is heaven on earth, then Harborside Three is the pearly gates. Begin your idyllic day at this gorgeous corner-unit townhome with pancakes and coffee on the dining deck overlooking Nantucket Sound. Whisk away the breakfast dishes to the dishwasher, then decide: Stroll the cool sands of Francis St. Beach in your backyard? Or the cobblestone streets of downtown Nantucket, a 5-minute walk away? Or get your feet off of dry land and rent one of the beach kayaks for a spin on the Sound? In the evening, choose from the foodie and family-approved restaurants that line Main Street in downtown Nantucket. Afterward, it's just 1/4 mile back to your townhouse. Put the little ones to bed, then sip a quiet nightcap on the private deck off the master bedroom while you watch the moon and the harbor lights shimmer on Nantucket Sound. Told you this was heaven! The open, sun-washed living space is anchored by a view of the Nantucket Sound through sliding glass doors. 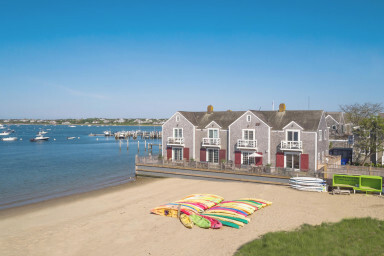 Nantucket style abounds, with beamed ceilings, white wood-paneled walls and nautical touches. Open to the living space, your island country kitchen has everything you need to treat the family to a feast. Pick up fresh seafood from one of the fish markets and make use of the stainless appliances, center island and well-stocked cabinets. With the open layout leading into the living/dining area, the cook doesn't have to miss out on the fun. When it's ready, pull up a chair at the four-person table inside, or the patio table on the deck. Both have a view of Nantucket Sound to make your meal even more memorable. Both bedrooms are upstairs on the second floor and have their own private, en-suite baths and water views. The perfect arrangement for small families or friend groups, the suites include one with a queen bed and the other with two twins. The queen suite has a tub/shower combination and the twin suite has a roomy walk-in shower. There's also a half bath on the ground floor that serves the main living space.